You are not logged in. 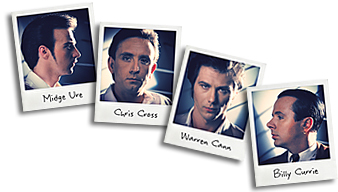 [Log In] Ultravox.org.uk » Forums » Socialising » Introduce yourself... » Greetings! #87942 - Wed, 08 Sep 2010 04:00:00 Greetings! Nice to join such a marvelous site! I am 40 years old and lives in Sweden (Oskarshamn) to be precise. I have been listening to this band since basic school. The first album I heard was "Quartet". #87943 - Wed, 08 Sep 2010 05:05:00 Re: Greetings! #87944 - Wed, 08 Sep 2010 16:39:00 Re: Greetings! #87945 - Wed, 08 Sep 2010 16:52:00 Re: Greetings! #87946 - Wed, 08 Sep 2010 19:44:00 Re: Greetings! #87947 - Wed, 08 Sep 2010 21:48:00 Re: Greetings! A warm welcome to the site and forum.